Auguri to all ! 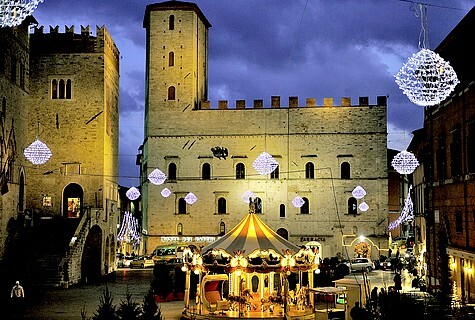 I thought I would finish the year by writing a blog on Christmas and New Year in Todi, the beautiful town where I live. A medieval hill town with ancient etruscan and roman remains and its piazza is classed as one of the finest in Italy, beautiful churches and palaces and a place which retains its medieval air from its ancient alleyways to its architecture, Not surprisingly, at Christmastime, Todi is a pure delight to visit with its many events, concerts, exhibitions and ice rink so I enjoy all its wonderful events year around. Traditionally, from December 8, is the commencement of Christmas festivities, right through until January 6. The piazza is even stunningly more beautiful with the ice rink taking centre stage surrounded by illuminated Christmas fir trees. The impressive steps leading up to the Palazzo del Popolo are lined with seasonal box plants in large ribboned barrels and shops around the piazza display bundles of twigs sprayed white on the outside walls, making a lovely simple display. 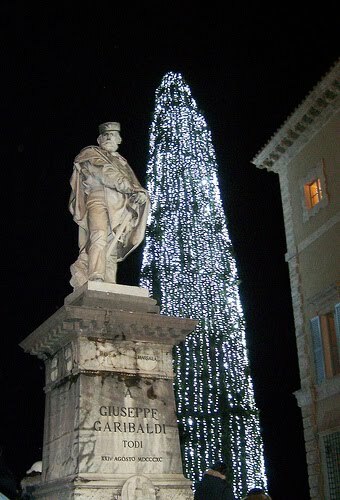 In the smaller piazza stands an enormous cypress tree which is illuminated and is the largest living decorated tree in Europe! Traditional Christmas classical music is played through its ancient alleys. So imagine all this combined with the exquisite architecture of the buildings that surround the piazza including the Duomo, really is a feast for the eye! The month long Christmas event commences with the opening of the ice rink and a beautiful exhibition of art by the acclaimed Umbrian artist Vincenzo Martini in the Palazzo del Popolo “Remembering the ancient past” artwork depicting medieval towns and its day to day life and activities in winter and twilight. The exhibition is free and open until 8 January. Really sets the scene……. The week-end of 17-18 December is Todi;s Christmas Market situated close-by the spectacular Basilica of Santa Maria della Consolazione. The Christmas market will include delicioius foodstuffs, books, art and objects, fine furniture – so a host of wonderful things. Sunday, 18 December at 6:00 pm in the Cathedral is the Christmas Concert followed by a music and dance spectacle in one of Todi’s small theatres. On 23 December, in the Tetro Communale will be a concert by a gospel choir. There are also a host of events for children throughout the period, especiall on Santo Stefano, 26 December. Todi’s New Year’s Eve Party kicks off at 10:30 pm under the medieval arches of the Palazzo del Popolo in the piazza. There will be a live band and ceremoniously at mid-night fireworks will herald the New Year! Season’s Greetings for a Happy and Peaceful New Year !